Sailing Plus S.A.R.L. has taken over the important sales areas Lebanon and United Arab Emirates as a new dealer for Bavaria Yachts. The sales office in Beirut can be found in the well-known La Marina Dbayeh. In Abu Dhabi, the catamarans, sailing and motor yachts of the largest German shipyard for serial yachts can be viewed in the luxurious Ghantoot Marina. The people behind Sailing Plus S.A.R.L. are CEO Cesar Abi Akl and H.E Mohammad Al Qamzi as owner. Since November, Bavaria Yachts Iran have been representing the largest German shipyard for catamarans, sailing and motor yachts at the Persian Gulf and the Caspian Sea. Now Bavaria Yachts Iran present themselves for the first time at the boot 2017 from 21st to 29th January in Düsseldorf Germany. The companies DPSI and KGC under management of Mr. Hamid Savadkouhi and Mr.Kambiz Yahyazadeh have cooperated in becoming active representatives of Bavaria Yachts. Bavaria Yachts Iran's head offices are in Teheran and Sari with a further office on Kish Island in the South. A showroom for the latest range of models by Bavaria can be found in Sari at the Caspic Sea. The opening of further offices is in progress in other locations at the Caspian Sea, e.g. Anzali Port as well as Abbas Port, Booshehr, Chabahar and Queshm in the Persian Gulf. Horizon Yachts is turning 30 this year, and we have much to celebrate! Over the past three decades, Horizon Yachts has explored new oceans and tackled new challenges, growing into one of the top 10 luxury yacht builders in the world and the #1 builder in the Asia-Pacific region. In 30 years we have built and delivered over 780 yachts, including our flagship EP150 expedition superyacht, to owners around the world, unveiled innovative new designs, and expanded our Horizon family to offer sales and support to clients in 60 countries. We have created an anniversary logo that symbolizes Horizon’s success over the past 30 years as well as our commitment to continue creating dream yachts for our clients around the world; we will also celebrate in this special milestone with numerous events this year. We are excited to share in this 30 year celebration with our owners, clients, and industry friends! 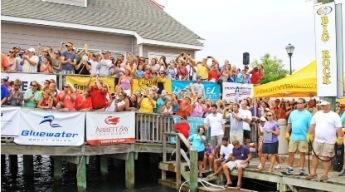 The Big Rock Blue Marlin Tournament board of directors announced Wednesday that Jarrett Bay Boatworks, a premier builder of custom sportfishing boats in North Carolina, has been named the official Major Sponsor for 2017, 2018 and 2019 tournament seasons. Owner, Randy Ramsey has served on the Big Rock board for more than 30 years and has been a strong leader in placing Big Rock on the forefront of world-class fishing tournaments. As part of the comprehensive Presenting Sponsorship package, Jarrett Bay Boatworks will receive top billing on the coveted annual Big Rock official t-shirt, on commercial advertising and on all print collateral and social media. In addition, Jarrett Bay stands proudly beside us with our charitable contributions, among a host of other benefits aligned with our national and on-site marketing plans. The Big Rock Blue Marlin Tournament began in 1957 with a purse of $250 silver dollars and celebrated a record purse of $1,914,100 in 2016. Since it began, Big Rock has donated over $4.3 million dollars to charity. Big Rock and Jarrett Bay will work together to further the upward spiral of a successful tournament and to expand Big Rock’s charitable giving for worthy organizations across the county and state. What’s a Nordhavn story these days if it doesn’t include some crazy 12-day non-stop voyage at sea? Or a tale about reaching the ends of the earth? Or circling it, for that matter? Propelled by celebrities Twitter accounts and 24-hour news channels, it seems like news is not worth reporting unless it contains shock value or one-upmanship. The same might be said about Nordhavn. Though truly, we are more awed than shocked with the achievements and accomplishments of our owners. Still, you never hear about the average couple who have purchased their first trawler and spent their first summer cruising up and down the East Coast. Learning the systems, the operations, the fuel management conquering these in and of themselves are a great achievement. So to kick off 2017, we are hailing the not-so-insignificant accomplishments of owners who have yet to cross an ocean or explore some island in the middle of nowhere or perhaps never will. There’s great pride simply in owning and handling the greatest long range cruising boat on the market today, regardless how far from shore they travel. And in fact, there are more people who can relate to these folks than there ever will be those who connect with the 100,000 nm pennant earners. John Folvig and his family purchased their brokerage Nordhavn 62 back in April and just weeks ago received their 2,500 nm Distance Pennant. They’ve logged 3,300 nm on Ocean Quest, which they accumulated via east-to-west coast trips around Southern Florida via the Keys, as well as day trips from West Palm Beach to the Bahamas, all in the name of building experience and confidence in the boat. Alas the Sarasota-based Folvigs have their sights set on more than just exploring their home turf waters. The family which also includes John’s wife, Jen, and 3 young sons – decided their 2016 Christmas vacation planned for onboard the boat would be the ideal jumping off point to a six-month Caribbean cruise which commenced with celebrating the holiday at the Bitter End Yacht Club in Virgin Gorda. The clan’s itinerary calls for additional stops in Puerto Rico, the Dominican Republic, Turks & Caicos, and the Caribbean islands. No, it’s not extreme or unique cruising by any stretch, but it is the adventure of a lifetime for the Folvigs (and seriously, who among us wouldn’t want to trade places with them?) At the end of their six months John estimates they’ll have racked up another 4,000 total miles, and another pennant! Also celebrating a 2,500 nm Distance Pennant last month were Scott Keihle and Paula Rawls on Nordhavn 55 Tabula Rasa as well as Scott and Glenda O’Connor on their Nordhavn 40 called Cocamo. Congratulations to you all! The first Distance Pennant is awarded at 2,500 nm, the second at 5,000 nm. Subsequent pennants are issued in 5,000 nm increments. The Riva coupé triumphed in the category Custom Yachts during the ceremony held at the London Boat Show. The Riva 76 Perseo has won the first nautical award of 2017, confirming the supremacy of style, comfort and technology that has made it one of the biggest hits in Riva’s recent history. The setting of this triumph is the 2017 edition of “Motor Boat Awards”, organized by IPC Media, the British publisher of some of the most important international nautical magazines. The ceremony took place in London last Monday, 9th of January, during the Gala dinner organized at “The Rosewood Hotel”, in conjunction with the 63th edition of the London Boat Show which will run until the 15th of January, and to which Ferretti Group participates through its exclusive dealer Ventura UK. The Riva 76’ Perseo, characterized by a unique design and a deep sporting spirit, was awarded the prize in the Custom Yachts category. The Custom Line 108’ was In the same shortlist, reflecting the unanimous appreciation of the Ferretti Group models by the jury and industry professionals. The award has a particular value, as it is allocated on the basis of technical, aesthetic, innovative criteria, and only awarded after thorough performance tests and sea trials carried out by journalists and the publishing house, supported by engineers in shipyards. Australia’s most-awarded luxury motor yacht builder, Riviera, has announced the appointment of respected marine industry identity Scott Dillon as the new dealer principal of R Marine Pittwater in New South Wales, Australia. Riviera chief executive Wes Moxey said Mr Dillon has boating in his bloodline and is very well known to Riviera and Belize owners on Sydney’s Northern Beaches and North Shore. R Marine is Australasia’s only network of luxury motor yacht dealerships and offers the growing Riviera and Belize family unparalleled levels of customer care and support, 7 days a week. R Marine Pittwater located at the Quays Marina at Church Point will provide owner support, assistance and create fun-filled social events and cruises for the growing number of Riviera and Belize owners who choose to keep their boats in the Pittwater, Broken Bay and Central Coast regions, and also to those cruising north or south along the NSW coast who may require specialist Riviera service or maintenance assistance. Through his passion for boating, Mr Dillon has remained in close contact with many Riviera owners since the family-owned and operated LDM Riviera was sold in 2013. With great pride Sanlorenzo announce the appointment of Lengers Yachts as the new official distributor for North Europe. This strategic agreement addresses the growing demand for Sanlorenzo made‐to‐measure motor yachts in the region. “A match made in heaven states Bas Lengers, CEO of Lengers Yachts. For more than forty years Lengers Yachts has been making the difference in the yachting business and throughout these years our company has been active in the top segment of luxurious, Italian brands. We now have a huge experience understanding and accomplishing everything our customers desire”. Massimo Perotti Chairman/CEO of Sanlorenzo Spa said: “Sanlorenzo represents the atelier of the yachting industry where passion for quality, elegance and exclusivity become a common heritage. Our made‐to‐measure approach has always been extremely appealing for German and Benelux owners. This partnership with Lengers Yachts makes perfect sense as we share a long term experience in this market as well as common values and vision. I’m excited about our joint growth in this area”. Sunseeker International is delighted to announce that award-winning British actress Joanna Lumley OBE, and Britain’s Got Talent Finalists, Jack Pack was the company’s special guests at this year’s London Boat Show on Friday 6th January. Joanna, perhaps best known for playing Patsy Stone, in the popular sitcom Absolutely Fabulous, opened the stand with founder Robert Braithwaite CBE DL and CEO of Sunseeker International, Phil Popham. Sunseeker’s 40m Yacht ‘Thumper’ made a star appearance in the Absolutely Fabulous The Movie which hit worldwide cinemas in July 2016. Joanna’s character Patsy, and co-star Edina, played by Jennifer Saunders, found themselves sipping Champagne on the prestigious luxury yacht in the bay of Cannes. However, there is a far more important reason for Joanna joining Sunseeker at the show this year. As a good cause champion, Joanna has also been involved with Macmillan Cancer Support for a number of years, her support includes being involved with the Macmillan Centenary celebrations, ITV’s Text Santa and more recently hosting her own World’s Biggest Coffee Morning with M&S. In June 2016, Sunseeker International announced its support for Macmillan and nominated the charity as their local charity partner, helping to raise funds and support people affected by cancer in the local Dorset community through various activities including sponsorship of the very successful annual Dorset Bike Ride. The brand has already raised over £50,000. The Jack Pack is a unique contemporary swing pop group made up of four distinct vocalists who channel a Hollywood elegance with a quintessentially British twist. The group were originally made famous by The X Factor in 2007 and have most recently featured as a finalist in Britain’s Got Talent. Signed to Simon Cowell’s label Syco, Jack Pack went on to achieve international success following their Top 10 self titled debut album in 2015. Showcasing a selection of its finest yachts from the current range, Sunseeker launched two new yachts at the Show, the world premieres’ of the Manhattan 66 and the 68 Sport Yacht. Sunseeker is also delighted to not only showcase the largest display of yachts at the London Boat Show but also to once again exhibit, the biggest motor yacht at the event, with its 95 Yacht. Standing at 28 metres, the stunning 95 Yacht is guaranteed to impress all those who attend. The Viking 61 Xta-Sea bested a fleet of 50 boats to take the top spot on the leader board at the first leg in the Los Suenos Signature Triple Crown held in Costa Rica. Right from the start, Captain Ronnie Riebe made every bill-fish count with anglers Alexis and Julio Chamorro, Emilio Munkel and Jacob Graves. Xta-Sea was in the hot seat all week but on the final day of fishing put on the real heat. On Day Three the team released five marlin bringing their total to 18 bills and 12 of them were marlin. Other Vikings rounding out the top 20 were the Viking 55 Reel Screamer, Viking 46 Dealer's Choice, Viking 60 Blue Eagle, Viking 70 Mjoliner and Hooray, a Viking 80. For the three day event, there were 997 billfish released with a mix of blue and striped marlin totaling 212. We're ready for the action on the next leg! While fishing conditions were less than optimal, the 54th Annual Buccaneer Cup Sailfish Release Tournament was once again a premier event. Twenty-six battlewagons slugged it out off the Palm Beach Coast. Miss Annie, a Viking 52 claimed Second Place Live Bait Boat and Third Place Overall with five sails. Miss Annie angler Frank Napurano released three sailfish while Greg Bogdan and Mark Donohue each had one. The Viking 92 Fa La Me took Second Place Dead Bait Boat and angler Taylor Beckford was the Top Angler. Krazy Salt's, a Viking 70 was Second Place Dead Bait Boat and the Viking 56 Clamaholic took Third Place in the Live Bait category. Thirty eight sailfish releases on dead bait clinched a new record for the Creamer family's Viking 72 Ditch Digger at the Sailfish Club's Gold Cup in Palm Beach, Florida. A fleet of 21 boats released 449 sailfish at the event but Ditch Digger claimed the top spot on the leaderboard. Ditch Digger angler Glenn Creamer, Jr., released 12 sails and claimed 3rd Place Angler. Top Angler Anthony Cummings, fishing on the Viking 70 Krazy Salt's, released 13 sailfish. Rehab, a Viking 48, lit it up at the 80th Annual West Palm Beach Fishing Club's Silver Sailfish Derby. With Captain Nathan Shepard at the helm, Rehab angler Melanie Holliday released four sailfish to claim Top Lady Angler at the event. Way to kick off the New Year! Congratulations to Bob Novey and his team on the Viking 62 Finally for their win at the recent Tropic Star Lodge Billfish Tournament. Bob's grandson, Daniel Probst, was the top angler at the event located in the Pacific waters of Pinas Bay in Panama. The Finally team released one blue marlin, one striped marlin and a dozen sailfish. Bob is a long standing authorized Viking dealer located in Panama. Donald and Pat Allen's maiden fishing trip on their Viking 55, Lunch Money, was out of Key West the end of December and it raised some fish! Their daughter Kaki along with son-in-law Ryan and eight year old grandson Hudson joined the party and what a party it was. Hudson christened the boat with the first release, an estimated 88 inch sailfish with his dad following up with another. This fun loving crew added blackfin tuna and bonito to the list for the inaugural expedition. The Lunch Money gang wants to thank their fishing guide AJ Berry for a fabulous trip as well as Dan Howland from Galati Yacht Sales for his guidance.